Michael Blooman trained at the Royal College of Art and afterwards lectured at Maidstone College of Art. His first exhibition was in London in 1975. Later he taught Art and History of Art for many years at Brentwood School. When he lived near Maldon, the East Anglian Coast became an absorbing subject for him particularly for the Sailing Barges. He now lives near Lyme Regis where he works in watercolour and produces prints on his Albion Press of the Jurassic Coast. He has travelled far and wide to paint watercolours especially in Italy, India and Bhutan. He exhibits regularly and illustrates for publications. His work is in various public collections including that of the Lyme Regis Museum. ​Since the 1980s, Michael Blooman has frequently visited Lyme Regis to paint staying in his brother's cottage. The wild nature of Pinhay Bay, west of Monmouth Beach, has been the inspiration for numerous watercolours painted in situ over many years three of which resulted in ' The Fossil Foreshore' Triptych. He moved to Uplyme near Lyme Regis in 2004. "I have been fascinated by the uplifted strata and shale of the Jurassic cliffs in Pinhay Bay, with trees falling over the edge and strewn on the foreshore, strands of bearded lichen hanging from ledges and red oxide staining the cliff face. At low tide the Jurassic pavement with ammonite fossils embedded in the ancient sea floor runs far out to meet the lapping waves. A primeval solitude pervades Pinhay Bay. This has inspired my 'Fossil Foreshore' Triptych, large 76cm x 53cm linocut limited edition original prints. These have been produced on my Hopkinson and Cope Albion Press dating from about 1850. Each print is made from twelve blocks. This is a painstaking process. Once a block has been rolled up with oil printing ink, it is placed on the bed of the press within set tabs and likewise for the hand-made paper to ensure registration. 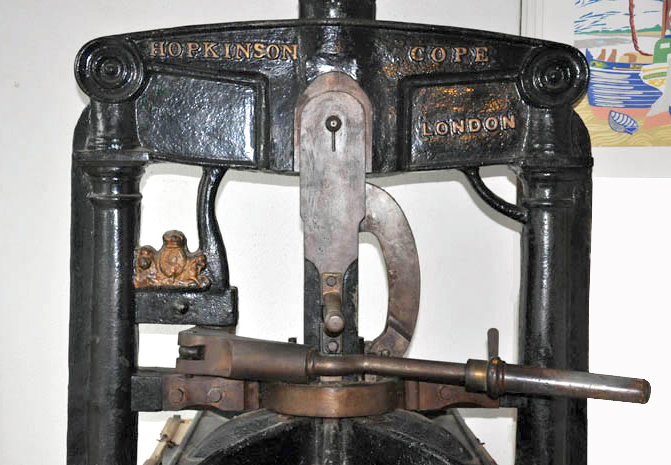 In the nineteenth century the Albion Press was used for printing posters. The mechanism is a system of toggle levers which exert pressure by a wedge on to the 34" x 22" plate. The handle is connected to a powerful spring in the crown on top of the press for the return of the platen." Michael Blooman first exhibited in London in 1975 and since has had exhibitions at Snape Maltings, Aldeburgh ; Beecroft Art Gallery, Southend ; Mercury Theatre, Colchester ; The Town Mill, Lyme Regis ; Dolphin Gallery, Colyton ; The Maeldune Heritage Centre, Maldon ; The Bhutan Society, London; The Lyme Regis Museum. He has written and illustrated an article on Bhutan for the RHS in 2011. He has been published by Art Angels. His work is in public collections including the Lyme Regis Museum. © Michael Blooman has copyright to all images on this website.